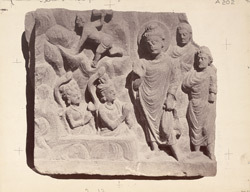 Photograph of a sculpture slab from Rhode Tope, Sanghao in Peshawar District taken by M.Serrot in 1883. This is one of a series of photographs taken for H.H. Cole at Mardan by Serrot. Cole wrote, "This is one of the panels placed between pilasters to surround the topes of the monastery. It represents Buddha's visit to the king and queen of the Nagas or snakes; Devadetta. Buddha's hostile cousin, stands on the left with the usual club in his hand. The meaning is that Devadetta has entrapped Buddha into visiting Nagas in hopes of their putting an end to him, but the divine influence is too strong and they worship him. Devadetta, enraged at his want of success, bolts up the mountain." From the first and second centuries AD onwards, Peshawar, in northern Pakistan, was famous for it's sculptural traditions. Known as Gandhara, it was ruled by a dynasty of Chinese origin called the Kushans. They were Buddhists and under their rule, the religion and the arts associated with it were allowed to flourish. The reign of the Kushan king Kanishka, is particularly well known for its artistic achievements and it was during his reign, from 78 AD, that we find the first examples of the Graeco-Roman influenced Gandharan style of sculpture. The classical influence on this sculpture slab can be seen, in the figures draped clothing, their curly hair and the naturalistic modelling of their bodies.